I think it is safe to say that every single person has run into a time where they just didn’t have enough battery power in their mobile device. Whether it just is due to random usage during the day or forgetting your charger and cord in another location, knowing just a little bit more about the limits of your battery is definitely handy. Just recently, the guys and gals over at GSMARENA did a nice little comparative test between the Google Edition Galaxy S4 and its counterparts. Check out how it did! Surprisingly enough, the Google Edition running pure Android didn’t live up quite to the expectations that most people held. When compared to a Galaxy S4 running the Touchwiz UI, the pure Android version of the device had a reduced talk time by about 6 hours. A huge difference! Notably, the Nexus devise running a pure version of Android were notable for not having great battery life, so maybe this doesn't come as a huge surprise? For the Video and Web Browsing test, the Google Edition stood up pretty well to the current edition clocking in better than the standard Galaxy S4 in the Video playback portion and coming in at 9 minutes shorter during the web browsing test. 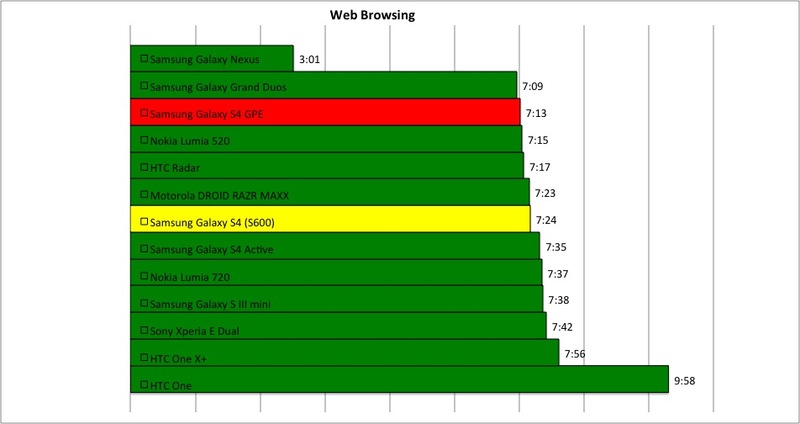 In the endurance portion, the Google Edition S4 came in at 63 hours, short of the 69 hours clocked in by the normal Galaxy S4, but ahead of the HTC One (48 hours) and the Nexus 4 (32 hours). All in all, the Google Play Edition of the Galaxy S4 shouldn’t be discounted simply because it has a little bit shorter battery lifespan in some tests, however, it’s interesting to note that a pure Android device would have a shorter life span than its counterpart running Touchwiz UI. How important are battery tests like this for you? Does it impact whether you will buy a certain device or not?